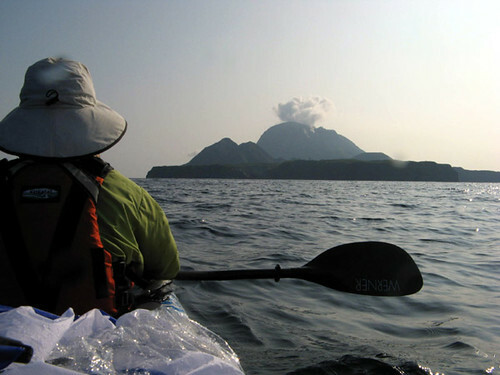 Visiting the three islands of Mishima: 3 days, 179km. Measured currents are shown in colors corresponding to tidal phase: red is low tide; flood tide goes through purple and blue towards high tide (turquoise); green, yellow and orange represent the ebb tide. 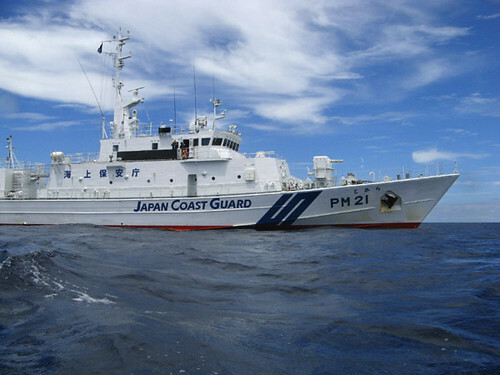 The strongest current encountered was 2.0 knots (north of Takeshima). 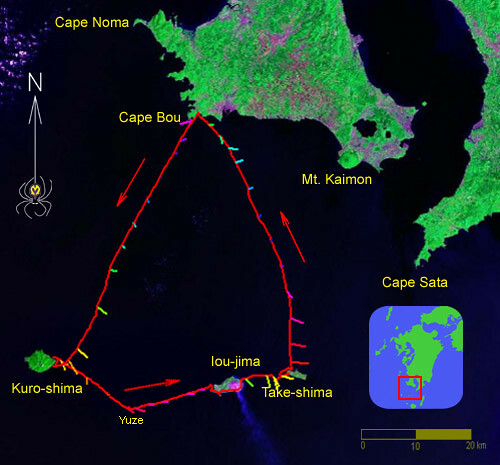 Note that the tidal currents here are influenced by the Kuroshio current, which is quite variable but generally flows west to east at about 1 knot near the Mishima islands. 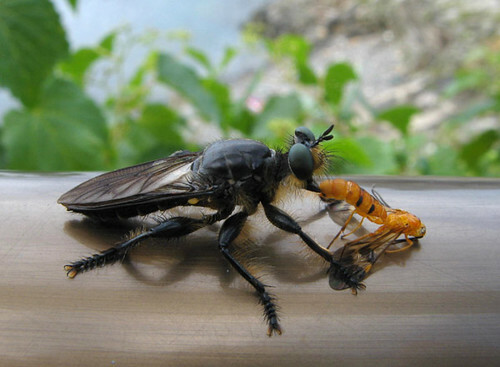 Late September in southern Kyushu generally still means midsummer weather, and the long weekend of the Autumnal Equinox (a national holiday) was to be no exception. We would have preferred slightly cooler conditions, but since we were granted three days off work on account of the autumnal equinox national holidays, we fully intended not to waste this rare opportunity. We set our sights on Mishima Village in Kagoshima Prefecture, a name which means, rather appropriately, Three Islands. 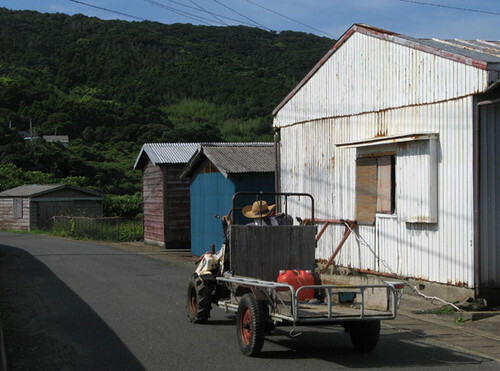 Indeed, the village consists of three loosely spaced islands about 50km off the southern coast of Kyushu: Kuro-shima, Iou-jima, and Take-shima. With a total population of only about 450 people, virtually no stores and not a single drink vending machine, it’s the kind of place we really love to visit. 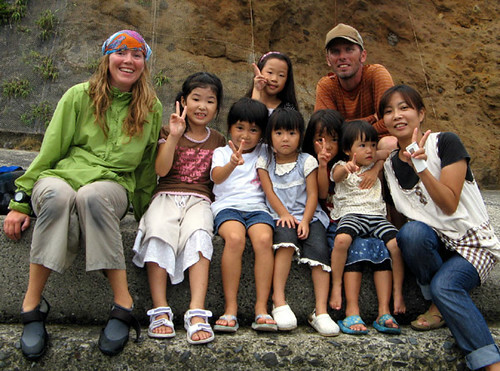 We would be reunited with friends we made on our visit to Kuroshima last year, experience the steaming volcanic scapes of Ioujima with its dormant volcano, and take in the scenic rocky coasts of Take-shima as well as the other islands and rocks along the way. 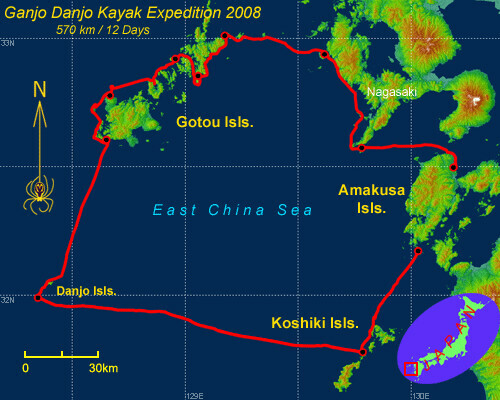 On Sunday and Tuesday we would do the traverses there and back, respectively, which would leave Monday to explore the archipelago. 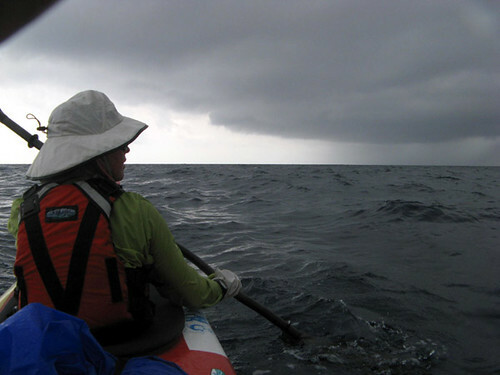 Two days of open-water paddling seemed a high price to pay to see these isolated specks of land, but the call of the unexplored in us was strong enough to overcome the monotony of the approach and return days. In retrospect, of course, it was worth it. 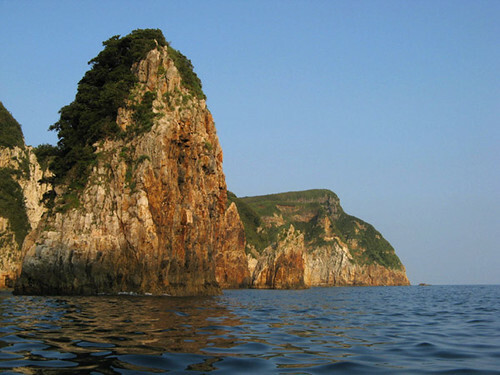 Cape Bou, the southwest end of Kyushu, was our point of departure and return. With a touch of apprehension Leanne surveys an approaching squall. The weather forecast looked reasonably good but our own conditions left a bit to be desired. On the morning of the day before our departure we got up very early to bike up a mountain in Amakusa well known as a milepost in the seasonal migration of goshawks from Siberia into the tropics. And on Saturday after work, we loaded the Waterfield "Whale Watcher" tandem on top of our tiny car (it was about twice the car’s length) and departed southward. Virtually sleepless for the second night in a row we arrived at Bounotsu on the southwest tip of Kyushu, our kayak departure point, at about 2am on Sunday morning. But we were too exhausted to embark just then on the difficult, long traverse, so we felt obliged to grab a few hours of sleep. But as soon as it got light we were on our way. The morning’s clear weather soon deteriorated and some rain showers made a rather dramatic approach from the northwest. At least in the downdraft of the first squall we got the opportunity to try the new oversize WindPaddle Cruiser sail specially designed for tandems and bigger boats. We were giving the sail a test run before sending it off to the Commando Team who would use it for their tour in their 4-person kayak designed for them specially by Mr. Mizuno of Water Field Kayaks. And though the wind was no more than 15 knots, the sail propelled our tandem at 6 knots or so – very respectable. 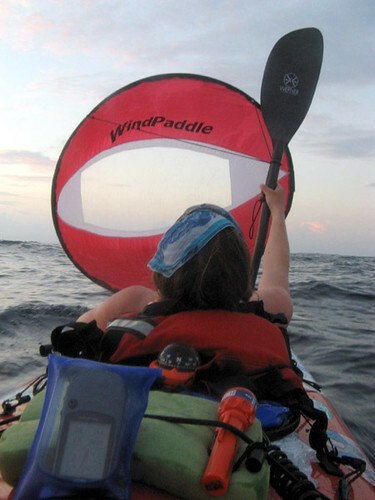 Too bad the wind changed after only 30 minutes or so, leaving us to propel ourselves the rest of the way by our own paddle power. 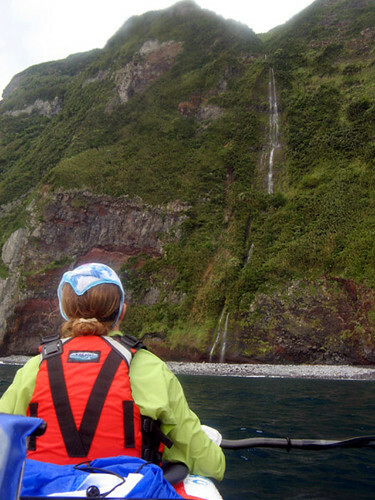 Numerous waterfalls like this one drop down Kuroshima's cliffy coast. The welcome party at Kuroshima. We arrived at Kuroshima in the late afternoon in gloomy conditions, but we were delighted to see our friends waiting for us. Of course, where else would they be on a Sunday on this tiny island, except in the port fishing. Not feeling especially tired, I went snorkeling with Mr. Eguchi, a local teacher and our friend, until it got dark, and was delighted to find clear water with many interesting fish to look at. In the evening we retired to Eguchi’s house and enjoyed an evening of drinking and chatting with several other school teachers. We stayed up a little later than we planned, of course, and were up again at 3am, an appropriate time, I figured, to catch favorable currents on our way to Ioujima. 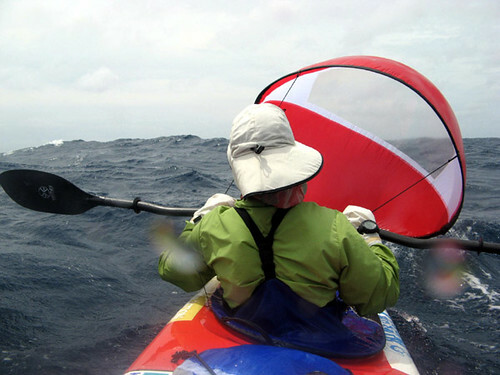 A cold wind was blowing but once we paddled out it became dead calm and much warmer – the wind had only been cool air descending from the 700m summits on the steep, mountainous island. 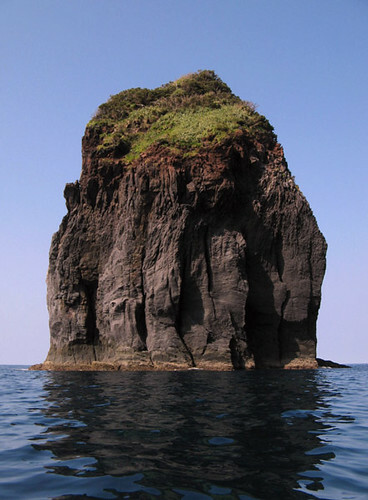 Yuze Rocks, also known as Den-shima, poke out unexpectedly from the sea halfway between Kuroshima and Ioujima. Sunrise caught us as planned near the isolated Yuze Rocks located half-way between Kuroshima and Ioujima, and one of Kyushu’s more famous fishing spots. Atypically, the sea was calm and smooth as a mirror. For once the currents were turning out as expected and the rest of the 30km traverse also went smoothly and uneventfully. In late morning we were already enjoying the bizarre rocky formations along the western coast of Ioujima. 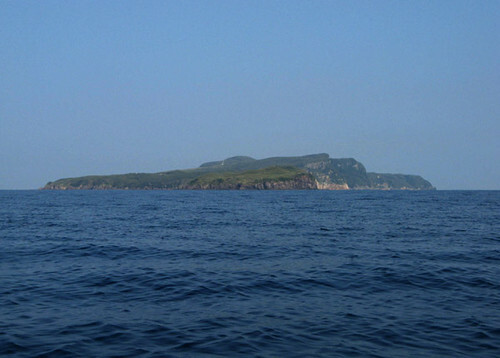 Approaching the volcanic island of Ioujima. 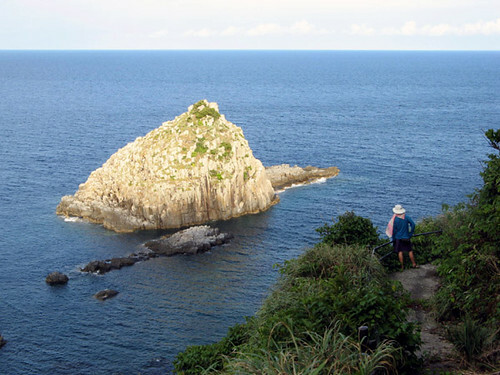 One of numerous scenic rock fomations along the western coast of Ioujima. As we rounded the long, southward-projecting cape of Kuchinoerabu-saki, the water suddenly turned the color of mango juice. 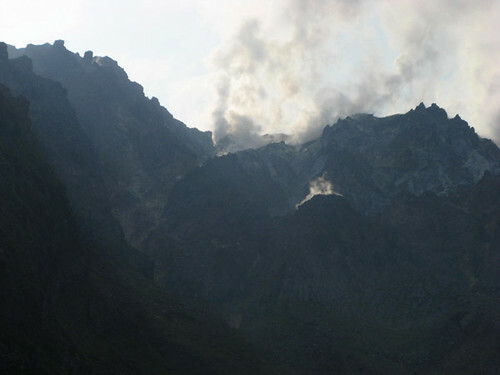 This was due to mineral rich volcanic springs scattered along the coast and the sea bottom along the entire eastern half of the island which is dominated by the steaming volcano. We made a lunchtime stop in the port and village where we met a friend of Mr. Eguchi's, who had been forewarned of our imminent arrival the night before. He told us interesting anecdotes about the island and showed us the village’s tiny museum of local artifacts. Through his assistance we were also able to check the weather forecast on the Internet, which continued favorable although a bit of swell from a distant typhoon would be coming in overnight. 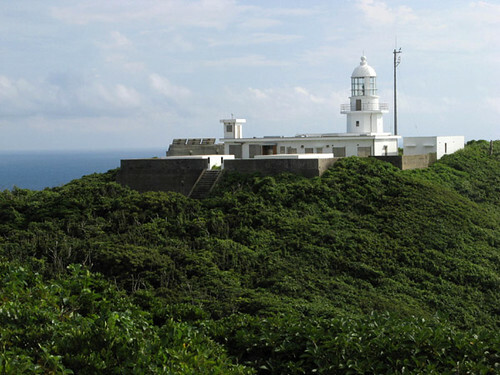 He kindly offered to drive us around the island to see the sights and tempting as this sounded, we realized we had to move along if we were to reach Takeshima comfortably before dark. 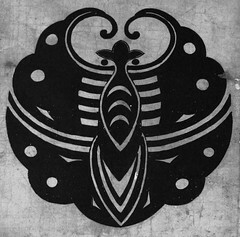 A family crest on display at the Ioujima village museum. 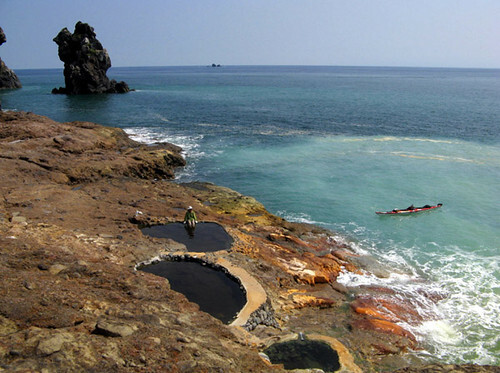 Underwater volcanic springs tint the seawater in Ioujima's port. Higashi Onsen - as far as hot springs go, it doesn't get much better than this. 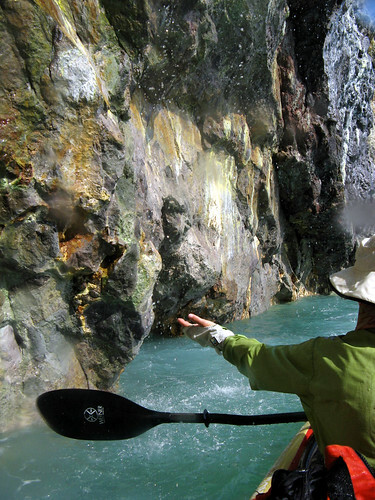 Under Ioujima's volcano, the coastal cliffs are stained by mineral hot springs. Before leaving Ioujima altogether we stopped at Higashi Onsen, one of several natural hot springs. Besides the manmade pools designed to catch the ample steaming hot mineral water gushing from cracks in the cliffs, there are no facilities and the use of the pools is free of charge. Unfortunately, it was the middle of a hot, blindingly sunny day and although we took a brief dip in the 44C water, it was much too hot to be truly enjoyable. We’ll have to come back in the winter! Anyway the scenery around the pools was wonderful, with views of the volcano, rocky coastline, and the open ocean. Continuing eastward along the coast, we saw multicolored cliffs and caves dyed by hot springs that seemed to issue out of every crack in the rock. 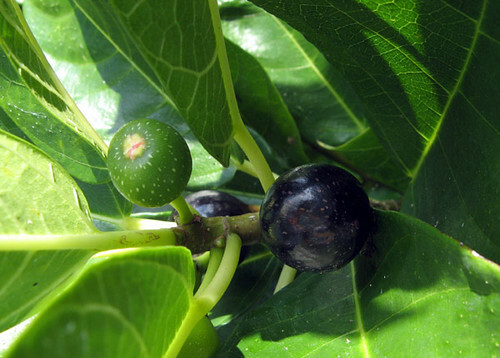 It was like looking at a surrealist paining, and we’d never seen anything like it before. Several of the caves had a stream of hot water dropping straight into the sea from the ceiling. 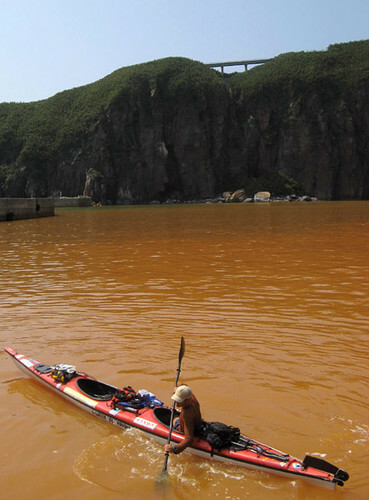 We would paddle through these curtains of hot water with great delight, thinking, what an incredible place this is, and incredulous that more tourists, be it kayakers or others, do not come here in greater numbers to enjoy it. Hot water raining down from the cliffs. 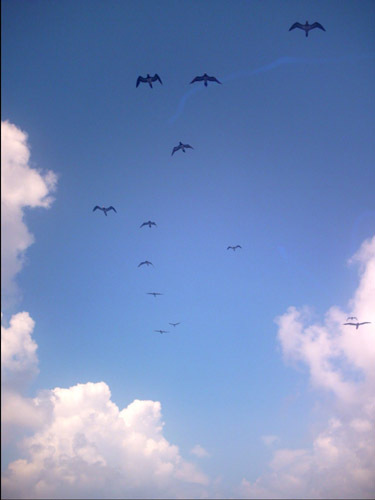 The awesome scenery of Ioujima's volcano. On the relatively shorter traverse to Takeshima, we passed by the “New Ioujima”, a pillow of bizarrely sculpted lava that emerged out of the sea sometime in the 1920’s, very black and still completely devoid of plants. A little further on, we spotted a pod of dolphins swimming in an eddy line of the current, jumping playfully. The sea was glass smooth although the forecasted swell could now be felt a little. Takeshima, the flattest of the three Mishima islands, nevertheless has a steep, cliffy coast with now loomed in front of us. 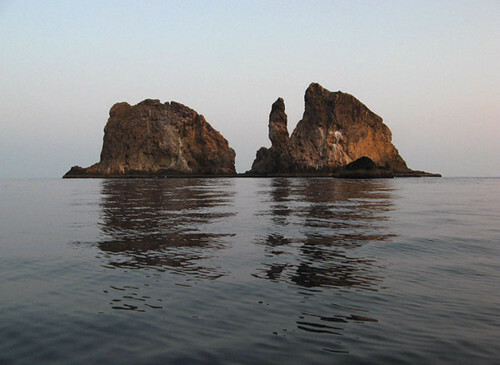 In a most unlikely place among some rock pinnacles, a small bay tightly surrounded by vertical 60-meter cliffs on three sides suddenly appeared and presented a claustrophobic harbor. Lit by the setting sun, it was a scene of great beauty and we felt tempted to camp here. A small concrete pier within the pristine landscape offered a convenient camping surface. A vertiginous staircase that zigzagged straight up the cliff above. After a relaxing swim we decided to climb out and look around the village; it was only then that we noticed the staircase was in great disrepair and barely passable. On the top was a historical sign describing the disasters that befell mariners from ancient times onward who were lulled by this deceptive cove. 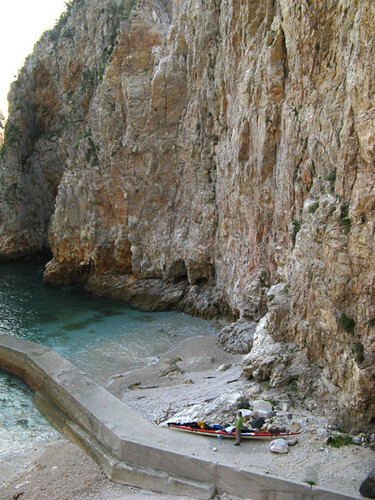 Once battering waves from the south block the narrow entrance, there was literally no way out and their boats were smashed against the vertical cliffs. 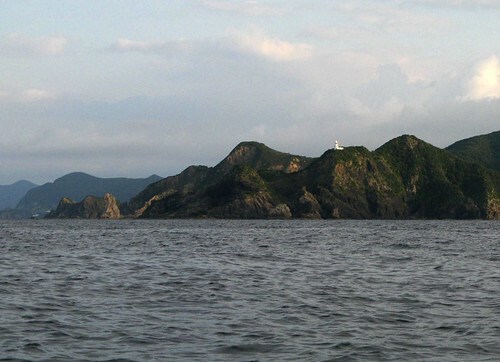 Approaching the deceptively flat-looking Takeshima. 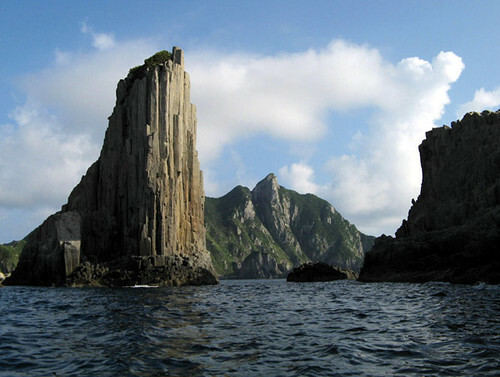 Takeshima's flat interior is guarded by fearsome sea cliffs. 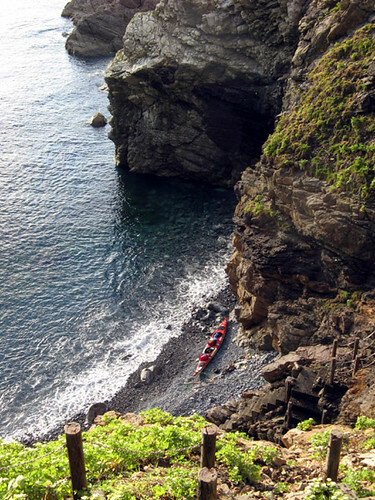 Komori-kou, a claustrophobic cove from where we would make a midnight escape. 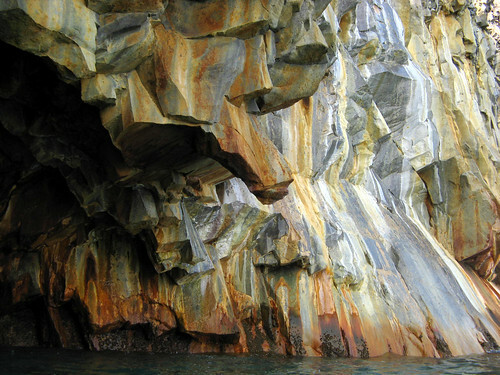 The seascape of vertical cliffs was a stark contrast to the plateau-like surface of the island interior. Impenetrably overgrown by a species of low bamboo – Take-shima means Bamboo Island after all – which had long ago choked out all other forms of vegetation, the only passable spaces here were man made. A network of rustic roads connected fields where the bamboo had been cleared. The small village was set into a slope which led steeply down to an unnecessarily large, concreted harbor on the island’s north side. As we filled our water bottles (the island’s tap water was surprisingly delicious) we met a diminutive old lady returning from the fields with a basket of freshly picked vegetables. We immediately struck up a bright conversation. It turned out she had come back on the ferry earlier today after visiting her ailing husband, who is confined to a care home in distant Kagoshima City, a world away. To visit there, we knew, is a small journey of several days, and we felt melancholy for her. But unflinching endurance of unthinkable hardships is one of the marks of the Japanese race, and this lively little old lady was no exception: not a shade of wistfulness showed in her eyes. In the meanwhile, darkness fell on the village; it was time to return to our private harbor. Once there, we pitched our tent halfway out on the jetty to avoid the possible hazard of falling rocks. But it was not to be the restful night we so badly needed. Sometime near midnight the swell increased and waves came crashing in noisily all around us. Finally one leapt clear onto the jetty and soaked half of our tent. Realizing that by morning the seas might be too high to launch into, and recalling the sign high on top of the cliff above us, we felt obliged to make a furtive escape in the darkness from this death trap of a harbor. Apprehensively, we prepared the boat and launched. 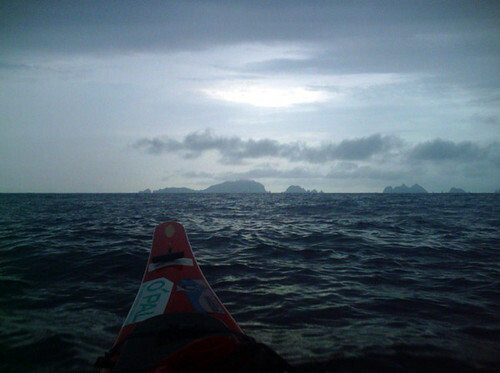 Struggling with the surf among the dark cliffs, we aimed for the safety of the open sea. Once a safe distance from land, we followed the coast, rounded the island and made for the concrete port, where it was dead calm and quiet. After a short stroll to calm our nerves, we were able to get a couple more hours of shuteye before the sun came up. Fuji-like Mt. Kaimon seen in the distance while returning to Kyushu. 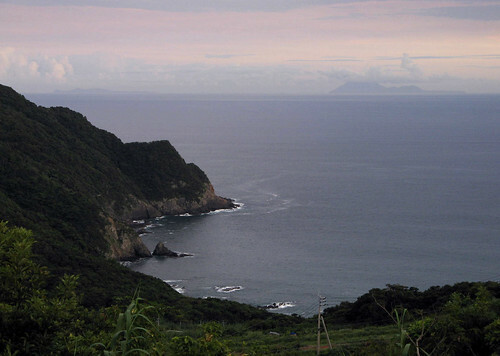 Takeshima and Ioujima seen on the distant horizon from near cape Bou. It was time to make our return trip back to mainland Kyushu. As expected, we had to work against the prevailing current. The forecasted headwind came in as well in the early afternoon. But it was an uneventful, if somewhat slow, traverse. About half-way across, a front with some light showers rolled through, clearing the hitherto hazy air like a stroke of a gigantic broom. One by one the surrounding islands re-emerged into sight, and soon the coast of Kyushu could be seen ahead, half-sunken under the horizon. Mt. 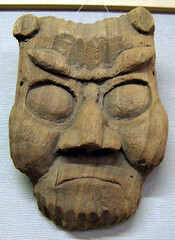 Kaimon, a faithful ¼-scale replica of Mt. 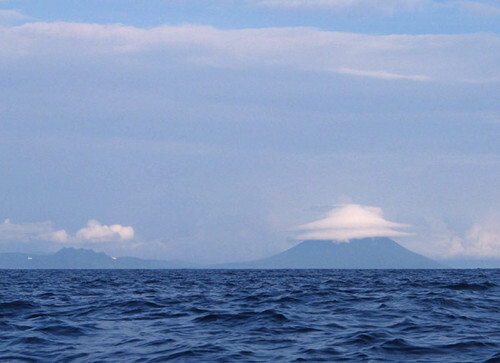 Fuji, loomed to the East draped with odd-shaped, multi-level, skirt-like clouds. Though exhausted by lack of sleep, mid-summer-like heat and the considerable distance we covered on this trip, our fatigue seemed to lift along with this curtain of haze. 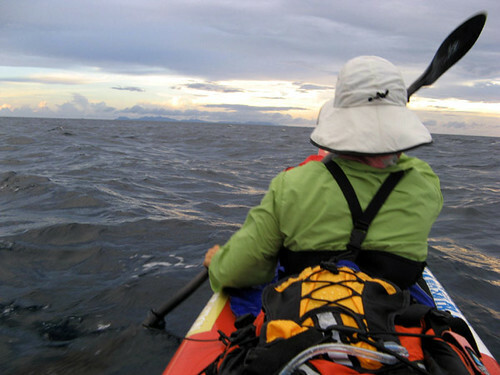 As we approached the coast at the end of our journey, we could not help thinking how lucky we were to have such amazing places available within the reach of the blades of our paddles. 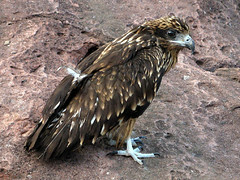 A juvenile kite encountered on the coast. A lot of tidewater has gone under the bridge, so to speak, since our last update. We’d like to say we’ve been too busy doing things to have time for blog updates. A big trip, river runs, island linkups, mountain bike tours, sundry summer adventures, slideshows…it’s all been piling up. For now we'll put up some pictures of our summer trip. We had promised our sponsors to write an article for an English language magazine about this and so we feel obliged to leave out the English text for now. Should the story appear somewhere, we'll let you know.